Electric Shaver vs Razor: How to Choose? 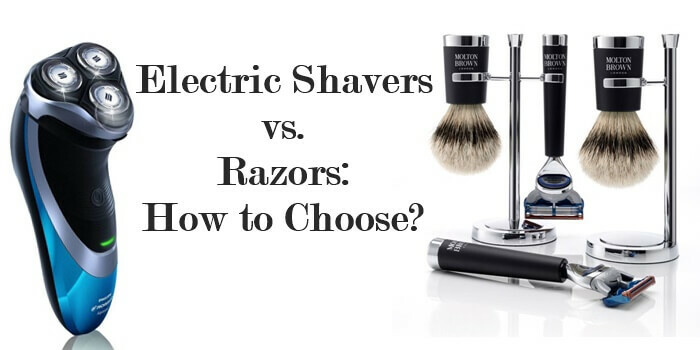 One of the age-old questions facing men who shave is “Which is better: Electric shaver vs razor?” There is a debate in the men’s shaving community where many men feel electric shavers are better while a multitude of other men believe razors are the right way to go. And while the debate may continue for a little more time and might not be solved simply by this article. There are many pros and cons to each shaving method that may determine which is the better fit and the better alternative for you. And there might not be a general consensus on which shaving method is better; the best shaving method for you is an individual choice and a personal preference. In this article, we will look at the differences between razors and electric shavers, investigate the best brands of both types, and learn how to make the best choice for you. The main difference between manual razors and electric shavers is electrifying (pun intended): Electric shavers are powered by electricity while razors are powered manually by the user. This difference is key into showcasing how you might find one method to be more or less beneficial than the other. As stated, electric shavers are powered by electricity. This means the electric shaver will provide you with a consistent and even shave each time, all the way through. Electric shavers often come complete with different guards and attachments to help you get the right shaving you are looking for, whether you are looking for a more close shave or are looking to trim on special areas like your beard, your nose, and/or your ears. One downfall of electric shavers, however, is that they aren’t able to get as close to your skin as a manual razor, so you might find that you might not have as close of a shave as if you were shaving by hand. On the other hand, manual razors are powered by you, the user. Being self-powered allows you to have more control over your shave and gives you the freedom to shave as you need to, customizing your shave to fit your best and most current and present needs. For example, if there are areas where you need to have a really close shave, you can do so with a manual razor. Also, you can often be more precise with a manual razor since you do have complete control over the areas you are shaving and to the extent you are shaving them. However, one of the downfalls is that manual razors typically do not have any attachments, so sometimes it can seem like you are either going to have a very close shave or no shave at all; there is little room for possible lengths in-between. Now that we have a little greater of an understanding of electric shavers and manual razors, let’s take a look at the best brands of both. Some of the best electric shavers brands include Philips, Braun, and Panasonic. These three brands have proven to be leaders in the industry thanks to their high-quality, powerful products that have generated strong brand loyalty and customer satisfaction. Philips’ electric shavers generally include a unique three-headed design that helps the user to get more close and more flexible shaves. Many of Philips’ electric shavers have a wide range of adjustable attachments for beards, nose, and ear trimming, and even haircuts. Braun’s electric shavers tend to feature more of the traditional, standard, bar-like shaving surface that resembles typical shaves found from manual razors, so if you are looking for an electric alternative to the manual shaving option, Braun’s line of dependable razors will be something for you to look at. Panasonic’s electric shavers often have multiple straight, standard, bar-like shaving blades that are designed to help you maximize the most out of your shave. With this style, you can get a comfortable shave that will be flexible across your skin, improving your skin’s health at the same time. Three of the best men’s razor brands are Gillette, Schick, and BIC. These three brands have proven themselves to be industry leaders, time and time again, with their lasting and durable products. Gillette is often on the cusp of the latest technology for helping men to get the closest possible shave they can with their razors. Gillette is always looking at the latest research to find what shaving works best and how they can best help shaving men. Their smooth and comfortable blades will make you feel good while looking good too. Schick’s razors are known for implementing strong moisture into the skin with their hydro technology. Manual shaving can often be hard on the skin, leading to razor burns and bumps, but with Schick’s proven technology, much of that frustration can be avoided. Lastly, BIC’s razors are typically known for being more disposable, making them great for one-time use and/or for traveling purposes. While still providing quality shaves, BIC razors will give you the flexibility in using a new razor each time you need. When it comes to making a choice for what will be the best for you, it is best to begin by deciding what method of shaving is the best for you: Electric or manual. Electric shavers are often ideal options for men whose shaving style differ from general, close shaves. If you have facial hair and need to work with trimming, adjusting, and maintenance, then electric shavers will be a good choice for you. Additionally, if you have sensitive skin, electric shavers do wonders for keeping your skin protected from razor burns and bumps thanks to the way in which the shavers are designed. If you often need a close, standard shave, then manual razors will be a prime choice for you. If your skin is not as sensitive as others, then you will enjoy this shaving style as well. Additionally, if you tend to have a lot of precise shaving needs to consider, you will enjoy the manual razor for this need. Perhaps, you would even like one of both, one electric shaver and one manual razor, to get the best of both worlds! Once you have this first decision completed, then it would be a good idea to begin looking at particular brands and which ones you think you would enjoy the most. This will likely become a personal decision to as to what you like and dislike about each brand and each specific product within the brand. After this is completed, you will be able to find the razor and/or shaver that is best for you! Choosing an electric shaver or a manual razor can be a difficult, time-consuming, and potentially frustrating process. We hope this guide walks you through the ins and the outs of the entire process, making it a little more simple for you to find what you are looking for. Let us know how your shaving adventure takes place! My name is John Shaver. I am an avid men's style enthusiast. I decided to start this website to review all my favorite shaving products and share some shaving and beard growing tips. As a member / participant of American Hair Loss Association and Professional Beauty Association, I can say that my advice has a value. Hope you enjoy! This post may contain affiliate links. This means that I will receive a small commission if you purchase through my link (at no extra cost to you). I will only ever promote the products that I trust and 100% recommend. You may read my full disclosure policy for more information. Thank you for supporting my blog in this way!